Many many years after the limited release of SymStudio, the successor Quigs is now in Pre-Alpha for testing for those that want to see what can be done with Symbos. There are some known issues, and many more improvements and fixes will come over the next few days/weeks/months. Download and unzip the directory. Running Quigs116.exe should put you in the Editor. You might need to change the settings to point to a suitable directory for Symbos. I have a partition f:\symbos where all my symbos apps are ready to run, so please alter each tutorials setting to compile to the place suitable for symbos. I'm sure this is all very unclear so please ask questions for those of you who interested to try. Here's a youtube video of me opening, examining, compiling and running an app on symbos with quigs. OH MY GOD, i can't believe my eyes!!!!! Going to post this on twitter!! Is there a chance for a Mac OS X or Linux version? Unfortunately no. Due to the language its developed in. Blitz.... this is because some of the core code is 12 years old and transferring it a more modern language seems too daunting now. Also the project in many respects is still not where I want it. I guess if somebody were to want to transfer it to say even the more modern Blitz Max (still defunct) which has Linux support then I would happily help. Thank you so much for all the work you did! I was so glad over the last years with your help. Because, without your IDE i was never able to create something for SymbOS! I really want to thank you as i know what effort you did on this! Can I just add that over the next few days, I'm going to be doing some Quigs language documentation, some video's and a roadmap. 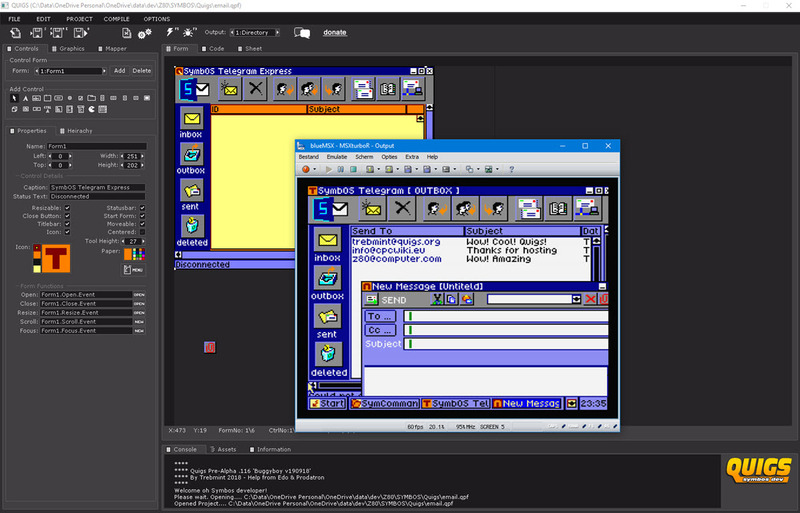 There are lots of missing/buggy features to do with Symbos support as is and I will prioritize those first, but the ultimate aim is for a editor that creates cross platform symbos msx/cpc/ep/ games at fullscreen and including the Powergraph card, Networking & everything else that Symbos supports. Oh by the way I'm fairly confident that as it stands the compiler spits out z80 as good as the better C compilers, and I plan to get it even better. A quick look seems to show that Quigs runs fine via Wine, which gives at least one option for Linux or OS X users. Is there some kind of instruction manual or overview for the commands / syntax? Not yet. But I'm slowly working on a simple manual and list of instructions/functions. I hope to do a few instructional videos over the next week.